You can mark files for removal by using [Smart Marking], [Mark all except one], [Mark Selected Files], [Clear All Marks] and of course, by hand. 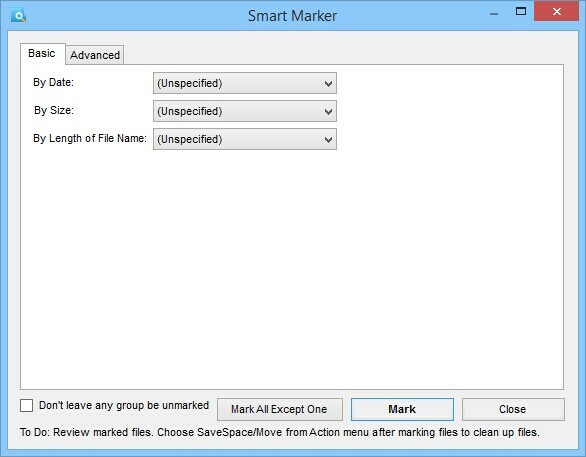 Smart Marking is the most efficient way to mark files for dfferent action (deleting, copying, moving etc). You can mark files for removal by size, date, version, folder and file name pattern. Select Mark > Smart Marker at the menu bar or Press [Ctrl-K]. To mark those older files, choose "Older File" under "By Date:" field and similarly for size and length of file name. Note: Choosing more than one criteria will mark files only satisfying ALL Criteria. To mark those files gif file under "My documents" folder and sub-folders, type "*.gif" under "By Pattern:", click show folders and check the box besides "My documents" under "By Folder" and select Sub-folder below. If all files in the duplicate file group are marked, you can check [Keep at least one file unmarked] to leave at least one file unmarked. It is NOT recommended to uncheck this box as it may lead to marking whole duplicate file groups. You can create your own combination of marking files by date, size, version, file name pattern and folder. If you want to make should all group is marked, you can check the box [Don't leave any group be unmarked]. However this option will NOT mark all files in a group. Finally, Click [Mark] to mark files which fulfilling your criteria. Or you can choose [Mark all Except One] to mark all files except one in every group. 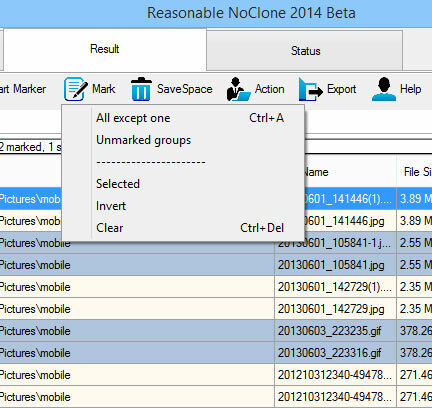 This is particularly useful if you just want to eliminate all duplicate files. Note: Since both original and duplicate files are included in the result list, it is recommended to keep at least one file in a group of duplicate files. Marking all file/no file and selected (highlighted) files are also provided. Choose: Mark > selected files , Invert all marks or clear all marks.